This popular soup made of meatballs and greens may be light on calories, but it’s loaded with flavor. Traditionally made with pork and beef, this healthy version calls for lean ground turkey. You may substitute your favorite greens – kale, collards or spinach, for the escarole. 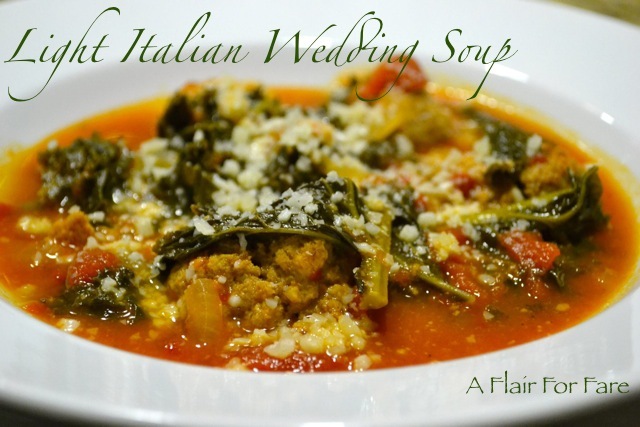 Whatever you choose, you will find this Italian-American classic to be hearty and delicious. Mix ground turkey with breadcrumbs, parmesan, garlic, egg, 1 teaspoon salt and 1/4 teaspoon pepper. Roll into 1 inch balls. Heat oil in a large soup pot. Sauté onion over medium heat until translucent. Add chicken broth and tomatoes and bring to a simmer. Carefully add meatballs and continue to simmer for 5 minutes until meatballs float to surface. Do not stir or you will break up the meatballs. Add escarole to the top of the pot. Cover and cook until wilted. Season with salt and pepper to taste. Serve with additional Parmesan.